Goodbye November. Hello December! It's unbelievable how another year flew by. Just a few days ago, I was planning my goals for 2017 (which I can already say that I miserably failed) and now a new year is just a few weeks ahead. Since I'm still recovering from a stomach bug (I think this is how you say it in English), this will be a short post. However, before jumping to the books I read and bought in November, there is something I would like to share with you. I participated on, for the first time, NaNoWriMo and wrote 53,405 words. I'm really proud of it because I never imagined to write so much in a month (I know it's probably the norm for many people, but not for me). In November, I only read three books. I must confess it was a really bad month since none of the books I read was very impressive and I found myself rating two of them with two stars. I shared my review of The Night Realm and you can find it here. I may or may have not got too many books this month. 🙈 Oh well, a bookworm will always be a book hoarder. Regarding the Shadow and Bone Trilogy box set (I already mentioned it here on the blog before), I ordered the old covers and received the new ones - in fact, I received the old box with the new covers. It was very strange... This is something that has never happened to me before. Does anyone know where I can get the old covers? Because now I'm afraid of ordering the books individually and also receive the new covers. Which books did you get in November? Wow what a wonderful haul!! Hope you enjoy those books. They sound stunning. Sorry November wasn't a great reading month for you, though:( But huge congrats on NaNo!! That's an amazing achievement. I'm really happy with the books I got - so in love with A Darker Shade of Magic *. * Aww, thank you. I still can believe I wrote 50k words. Happy readings & Wishes of a great December Amy. Congrats on NaNo! I have a feeling I also failed at my 2017 goals. I don’t even remember what they were. Have a great December, and enjoy your new books. Congratulations on NaNo. That's a LOT of words! I have heard really good things about Artemis and City of Brass. I will keep an eye out for your thoughts. Thank you. I still can believe I've written 50k words. I'm really intrigued by City of Brass - can't wait to plunge into its world. Sorry to hear the books you read weren't so great this month. Hopefully December will give you some good reads! Congrats on your writing challenge. So many words! Wow! I read an article somewhere that surrounding yourself with books is the mark of an intelligent person. Thank you. I can't believe I wrote 50k words in a month. It's a huge accomplish for me. So I'm visiting your blog now on my PC (last time I was on the phone, remember) and I think it looks AMAAAAZING!!! The colors and unbelievable, wow. Loving it! But why am I visiting this post? 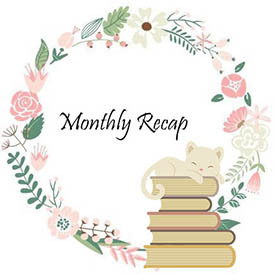 XD because I'm almost 2/3 of a month late to visit the November wrap up link up posts :D I was so busy! Ooh, you got Artemis! That's exciting. Aww,thank you so much Evelina. <3 Changing is a source of anxiety for me, so it's so good to read the opinion of other people. Ahah, don't worry about it. Better late than never. ;) Because of a chaotic schedule, I also take a huge amount of time to visit all the posts I want to and to reply all the comments I receive.